McCain, according to the NYT, has compiled a very short list of possibly running mates. So far, Gov. Charlie Crist of Florida, Gov. 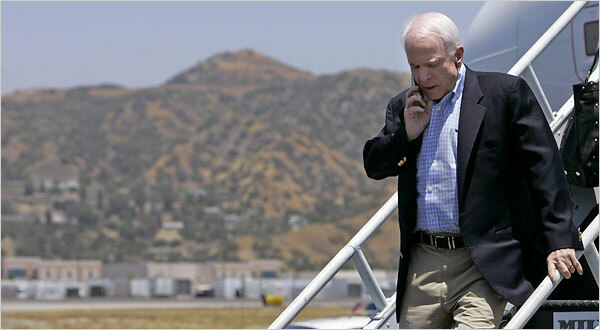 Bobby Jindal of Louisiana and Mitt Romney have been asked to meet McCain at his ranch. Notice that Huckabee is nowhere to be found. Most interesting of all of this is Gov. Bobby Jindal, the first Indian-American Governor in the United States. SepiaMutiny, a popular blog on Indian-American affairs has definitely taken notice. They (in my opinion) correctly note that part of the reason Jindal is in the running is to counter Obama’s appeal. In essence, it’s the “not a white guy” approach. Racist, perhaps, but something that is doubtless being considered. With someone “ethnic” on the slate, McCain would do well to avoid the inevitable charges of racism that will be levelled at him during the campaign against Obama. The NYT article has also smartly noticed that just the appearance of considering these people will help McCain’s campaign in their representative states, and it is possible that Jindal’s consideration is simply symbolic. Overall, Crist looks to be the favourite. Romney really doesn’t bring much to the table, besides maybe helping capture the democratic stronghold of Massachusetts. Crist can deliver Florida, a state that is undoubtedly embittered after the Dems decided not to award them their delegates at the national convention. Florida is what made Bush, and I imagine all eyes will be on it in this election too.